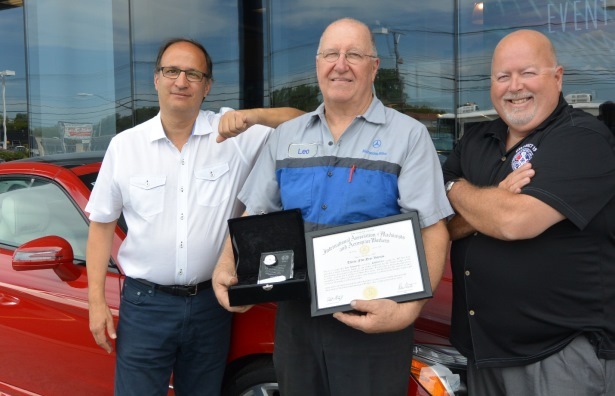 From left: Mercedes-Benz of Buffalo owner Robert LaMastra, Local 447 member Leo Shonitsky, and Local 447 Business Representative Norman Shreve. Shonitsky was presented his 35-year certificate from the IAM, a memorial clock etched in glass from District15/Local 447, and two round trip tickets anywhere Southwest flies from Robert LaMastra. After a 35-year career as an IAM Mechanic at Mercedes-Benz of Buffalo, Local 447 member Leo Shonitsky was ready to roll out his toolbox for the last time. But the owner of the dealership, Robert LaMastra, and several of his customers had other ideas about his last day on the job. Shonitsky has encountered many customers through the years, many of whom became regular patrons after he established lasting relationships with them. The LaMastra family and Mercedes-Benz hosted a luncheon for Shonitsky. Many of the regulars came in to not only wish him well in his retirement, but honor his dedicated service. Shreve presented Shonitsky with his 35-year certificate and a memorial clock on behalf of District 15 and Local 447.